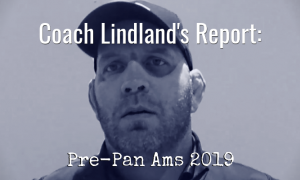 On Saturday, we released a look at what the general plan will entail for the Seniors this week out at Vegas World Team Camp — and last Monday, we presented a short Q&A with Junior World Team co-head-coach Nate Engel regarding what his squad will be working on in conjunction with the Seniors. This USA Greco-Roman consortium, as it were, cannot be overstated in terms of its importance. The Seniors, made up of only two returning members from 2017 and several who are embarking on their first-ever Worlds appearances at the highest level, will be formulating their offensive attack strategies and fine-tuning adjustments they hope will lead to success come October in Budapest. Engel and co-coach Herb House are beholden to a different deck of cards. Though there is upper-tier talent present throughout the lineup, a few athletes are newer to the style than others. With only roundabout six weeks until the Team plane takes off for Slovakia, a lot of work needs to get done; doable work to be sure, but no less vital in its nature. A talk with Junior World Team member Brady Koontz (55 kg, WI) coming your way imminently. Camp updates from Engel, House, US National Team head coach Matt Lindland, and Army/WCAP assistant Spenser Mango. Follow-ups with a few athletes everyone knows (and loves!). With the news that 2018 U23 World Team member Travis Rice (63 kg) has officially joined on at the Illinois Regional Training Center helmed by vaunted coach Bryan Medlin, it begs the question: who will eventually join him? 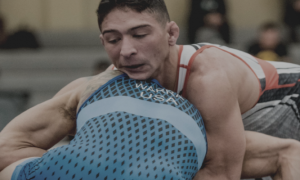 Illinois has a rich history of providing the United States Greco-Roman program with excellent Senior competitors, heralded athletes from Mike Foy and the late Lindsey Durlacher, to more recent stars like Ellis Coleman (67 kg, Army/WCAP) and Joe Rau (87 kg). But once these athletes graduated to their Senior careers, by and large, they bolted the Land of Lincoln in favor of other teams and training facilities around the country. With the Northern Illinois RTC — and now the IRTC on the campus of the University of Illinois (not to mention another place soon to be popping up) — this may no longer be the case. 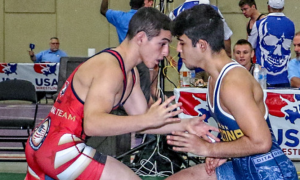 Illinois, like its main domestic age-group rival Minnesota, parades out more than its fair share of sizzling young talents each summer at the annual National Duals and Fargo. A high-enough percentage of these high schoolers wind up at least giving Greco a closer look later on, but still, too many wind up falling through the cracks. Regional training centers blossoming in Illinois may not only mean that wrestlers who always intended to stick with Greco stay home, but it very well may entice those on the fence to continue investigating what the classical style has to offer. 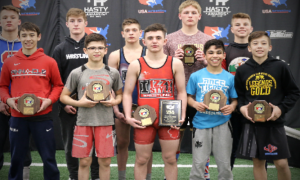 Needless to say, in both theory and practice, the Illinois pipeline not only remaining intact but also reinforced could deliver a gigantic boost to USA Greco in every way imaginable. Nolan Baker (67 kg) got the NIRTC on the map by headlocking his way to a U23 World Team spot. In fact, the NIRTC also had heavyweight Ross Sealby jump into the fray in Akron and come up with a fifth. Considering Baker’s obvious talent, his success could and should be a starting point that ushers in new recruits down the road, even if the Greco coaching isn’t yet as locked down as it is with Medlin some two-and-a-half hours away. This year, like most years, Illinois presented a few athletes who instantly profile as potentially tremendous Seniors. 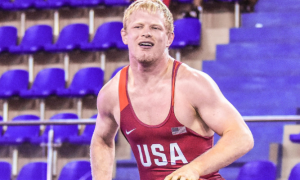 Zach Braunagel (82 kg) won Fargo Juniors over teammate Jack Jessen. It is very easy to imagine both of those guys fighting for Senior World Team spots eventually. 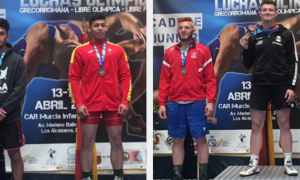 The same can be said for the Cramers, Adrian (72 kg, Cadet) and Alex (77 kg, Junior). Luke Luffman (110 kg) was a Cadet World Team member this year (and got robbed), and he took second in Fargo to Jace Punke, yet one more Illinois kid who could develop into something special. Then of course was the interesting case of the Lopez brothers, Fabian and Damian (60 kg, Cadet). The siblings advanced to the Fargo finals on opposite sides of the bracket but pointed their swords upward instead of facing off. And you know what? Good for them, it made their finals appearance that much more memorable. This is just 2018, mind you, an incredibly small sample size that neglects to include the dozens of other youth athletes who battled throughout the warm season representing what has been an undeniably stout program. Now that these toughs have more options at their disposal in their home state (and as mentioned, another coming very soon), Illinois is on the cusp of playing an even more defined role in the future of this sport in this country. Our lead story this evening. Good things apparently going down on Day 1 in Vegas. Learned a small movement that makes a huge difference from @mattlindland today thank you for that! And @ThatManChasin as a training partner made the practice enticing! After practice me and @George_TooRaw stuck around and I got to show him a couple tricks! Good practice team! Bisek tweeted. Actually twice this week. @NMU_OTS has 9 guys competing in upcoming world championships this is the season! Summer’s about to pick up for Miranda.